Jet.com is known for giving their customer’s innovative ways to save money. So for the holidays they launched The Careculator, an online tool that tells you what to spend on your friends and family based on how much they care about you on Facebook. It literally put a price on friendship. Using advanced careculus, the proprietary algorithm assigned a value to each like, comment and reaction, and divided that against the number of times a user posted in the last year. 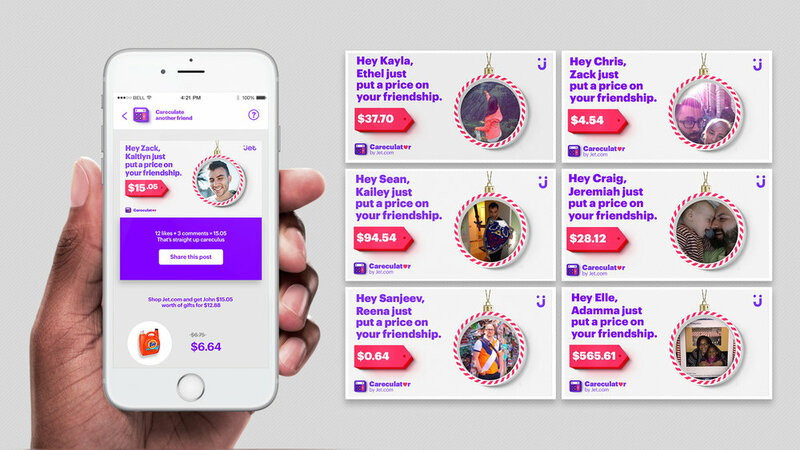 The resulting score was converted to a dollar amount – telling you exactly what your friends were worth to you… Every dollar amount was mapped to a personalized bundle of Jet.com products, showing you how much more you can get on Jet.com by spending less on the people you love. The Careculator tells you what your friends are worth to you, based on how much they care about you online. It uses advanced careculus to analyze your Facebook posts. It literally puts a price on your friendships.